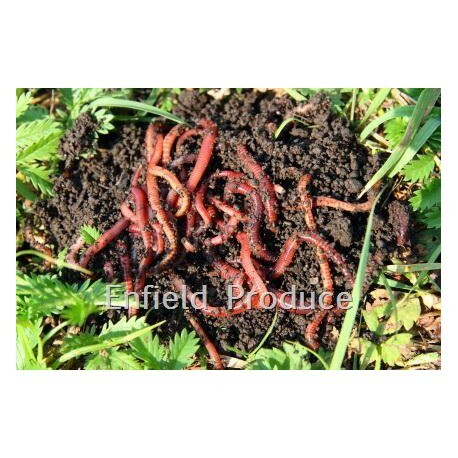 Compost Worms For Worm Farm Kits and other uses. Compost Worms eat our food waste – 1000 worms in a worm farm will eat around 125 grams of food waste per day producing valuable liquid, castings and baby worms for your garden. Over time the population will increase and depending on the size of your worm farm eat more and produce more. Typical domestic worm farms like the Worm Cafe are capable of producing around 2 litres of (10:1 diluted) liquid per week, 30-40kgs of castings per year and thousands of baby worms. Great care is taken to pack our worms in damp coconut fibre in polycarbonate woven bags for good air flow within a waxed box for safe delivery. 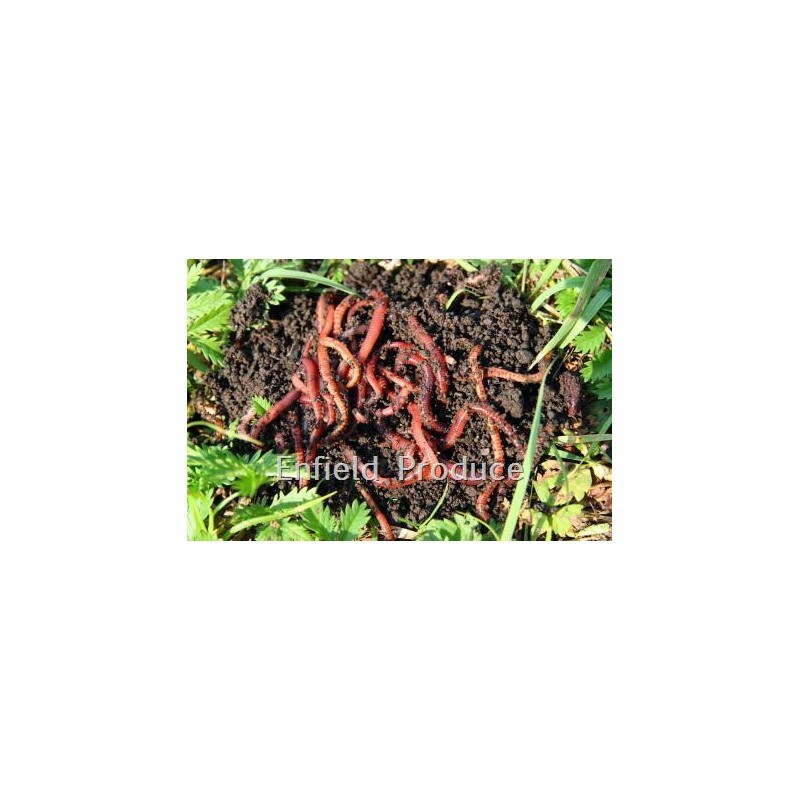 Compost worms are tireless in converting organic (food and garden) waste into worm castings (manure) which is a complete organic fertiliser for plants. Charles Darwin first demonstrated how worm castings rejuvenate and enrich the soil. His experiment with potatoes showed their roots growing directly towards the castings, searching for their fine balance of nutrients. There are three main species of compost worms also known as earthworms – Reds (eg, lumbricusrubellus) and the striped Tigers (eg, eiseniafoetida) are European imports now common in Australia, but there are over 300 native varieties including Blues (eg, Octolasion cyaneum). 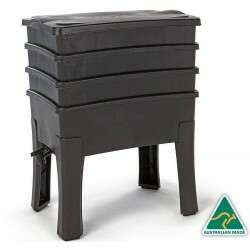 The average length of composting worms is from 50 – 150mm. Worm farming at home, work, school and in the community will help reduce pollution through landfilling. Around 5% of global greenhouse gases are caused by organics in landfills; worm farming and composting can stop this pollution and return the benefits to the soil. Worms in worm farms like to eat most fruit and vegetable scraps but need them cut into small pieces, as they eat by sucking. Acidic foods like citrus, onion and dairy should only be used sparingly with lime or dolomite added to balance the pH. Worm farms generally produce - liquid, castings and baby worms all of which make healthy additions to your garden. Compost worms can also be used as food for other animals like birds and fish, including use as bait. During autumn and spring and given optimum conditions, compost worms breed rapidly and may lay a capsule (cocoon) weekly. Each capsule contains between 2 and 20 baby worms which hatch in under three weeks and reach maturity in three months. Worms are hermaphrodites (both male and female); they mate and each worm becomes pregnant at the saddle (clitellum – the lighter coloured section around 20mm below the head). To breed successfully your worm farm should be kept damp, cool, quiet and dark. Q. 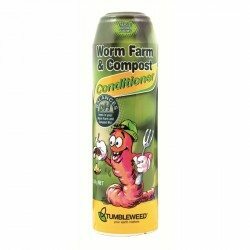 How many compost worms should i buy for a new worm farm kit? A. The manufacturer of the worms farms recommends starting a new worm farm with at least 1000 compost worms or more ideally. However, the worms will multiply and increase in number naturally over time. We would suggest that if you have a lot of scraps to break down from the very beginning its best to get 1000 to 2000 compost worms but if you don't have much or are willing to wait for a few months to build the worm population then you could get the 500 worm pack instead. Q. What type or variety of compost worms do you sell? A. Generally, they are Reds and Red Tigers. They are a mixture of compost worms but mainly they are of those 2 species. 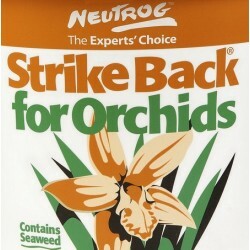 Q. I remember seeing a 150 pack of compost worms, do you still stock this size pack? A. Our 70 worm tubs are exactly the same as the former 150 packs. We changed the name to 70 after getting some complaints by some that the packs had less than the 150 worms per tubs. Compost worms can be difficult to find and count in dirt, hence we believe most customers are misjudging how many worms they are receiving. Nevertheless, to help people overcome this perception we have re-named the pack a 70 pack even though the manufacturer still sells them as a pack of 150 worms. Worm Farming FAQs From Manufacturer. Worm Farming is a fun way to turn your organic waste into rich fertiliser for your garden. And, while it's easy to do, the more you know about worms and worm farming, the more fertiliser you can produce. Can I use any worms in my Tumbleweed worm farm? There are many varieties of worms but the ones used in worm farms are called compost worms or more specifically "reds" "blues" and "tigers". These worms have a hearty appetite and they breed quickly – which is important because you want your kitchen scraps to be eaten as quickly as possible. How do I achieve the best environment for my worms? Your worms will produce the richest worm farm tea if they are kept in dark, warm, moist and aerated conditions. Of course, they should also be fed regularly. 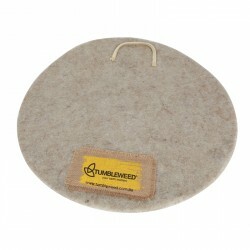 Add organic waste to the top working tray of your worm farm and place a Tumbleweed Worm Blanket on top. Spray the blanket each time you ‘feed’ the worms to keep the blanket moist. 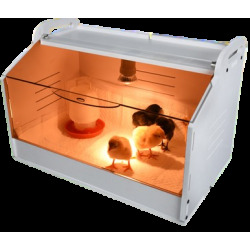 Ensure you keep the lid clipped in place to keep light and vermin out of your worm farm. You can sprinkle lime, wood ash or dolomite on your worm farm every few weeks. Alternatively, use Tumbleweed Worm Farm and Compost Conditioner, as directed, to maintain optimum PH levels. How do I keep vermin out of my worm farm? Keep the lid closed on your worm farm to encourage your worms to eat and reduce the likelihood of insects and vermin entering the farm. How do I start my worm farm? Place the packaging of your worm farm in the base of your first working tray, cover with the coir from the worm bedding block supplied with your worm farm (follow the instructions on the back of the block). Add at least 1000 (250grams) worms to the bedding material and cover it with a Tumbleweed Worm Blanket. Allow your worms a few days to settle into their new home then add a handful of food scraps to the surface area and replace the Tumbleweed Worm Blanket and the lid. Place your worm farm in a cool dry area away from the hot sun. How many worms do I need in my worm farm? Tumbleweed recommends that you start off with at least 1,000 worms. To ensure your worms are fresh, purchase them from a reliable source, such as a local worm farmer or reputable hardware store. Never purchase them in small plastic "take-away" containers as the worms are deprived of food and oxygen and will quickly die. 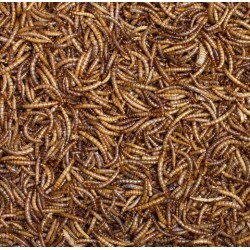 When you buy your worms check that they come with an adequate amount of bedding mix or castings. How much water should I add to my worm farm? The content in your worm farm should feel like a damp sponge. If it is too dry, a spray of water on each layer should provide the moisture needed to keep worms in a stable environment. If your worm farm collects rain, your worms could drown. Move it into a more sheltered position and add shredded newspaper to absorb excess water. Should I be concerned about insects living in my worm farm? Your worm farm is home to many different organisms. They all live in harmony and are part of the breakdown process. These other creatures will probably bother you more than your worms. So, as long as your worms appear to be eating their food, don’t worry about other ‘guests’. That said, if other organisms begin to develop in plague proportions, your worm farm may need help. Check the moisture level- it should be like a damp sponge. If it is too wet add shredded newspaper to absorb excess water. If the working tray has become too dry, spray the contents with water. Check what kind of food is being added. If you’ve added too much acidic food, you may need to add some Tumbleweed Composting and Worm Farm Conditioner to re-balance the pH level. The presence of vinegar flies is harmless but may indicate that too much food is being added for the number of worms in the farm. This can often occur in the early stages of your worm farm before they’ve had a chance to breed. 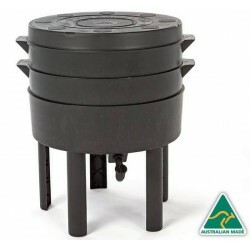 If ants become a problem a proprietary ant killer can be put down in the path of the ants, or the legs of your worm farm can be placed in small containers of water. Your compost worms will eat both raw and cooked food and vegetable scraps from your kitchen. 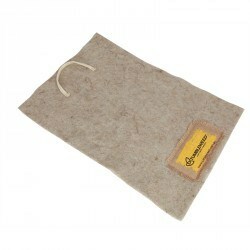 Coffee grinds, tea bags, dust from vacuum cleaners and soaked egg cartons can all be added. DO NOT add meat, dairy products or bread as these can attract vermin. While many experts advise not to add onions, citrus peel or tomatoes as these are very acidic, small amounts can be added as long as they are well mixed in with other food. What do I do when the working tray is full? When the top working tray is full (which takes about 4-6 months), take the bottom working tray and empty the contents onto your garden then return it to the top of the worm farm. Where should I set up my worm farm? Make it as easy as possible to add your scraps to your worm farm by setting it up close to the kitchen. Choose a shady place, away from hot sun, for your worm farm. It can sit on your balcony, down the side of your house, in the garage – or even inside your home. Why isn’t my worm farm producing many castings? Worms do not produce large quantities of castings (or warm poo). This is because of their diet. Fruit and vegetables are more than 90% water and so the liquid waste from worm farms is produced in much greater quantities than solid waste or worm castings. You may find it takes more than a year before you need to empty the working box. However, it is quite possible to harvest small quantities of castings to use in potting mix or seed raising mix at any time. 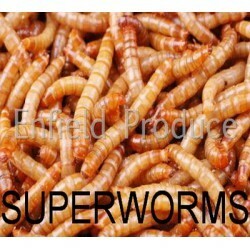 Superworms are extra large mealworms. 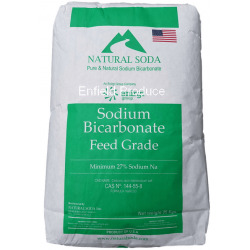 They provide a natural insect food and are an ideal source of protein for medium to large birds, robins, wagtails and most reptiles. See Freight Disclaimer.